Terry Goldstein is dying, but she manages to leave her highland home and travel by jet pod to Edinburgh for the funeral of her father. Later, at the reading of the will, she is surprised to have been left the company which had been her father’s lifetime obsession - the company that took him away, making him a virtual stranger to her as she grew up. 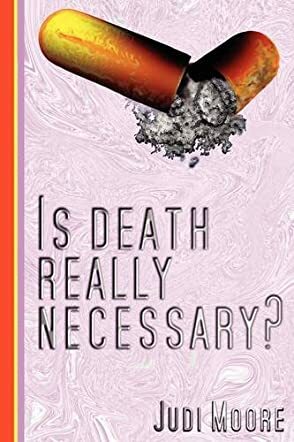 Is Death Really Necessary? by Judi Moore launches us straight into the complex world of nanotechnology and is a fast-paced adventure which will find Terry using the resources of her newly acquired company to launch a project to save herself; a project which will have far-reaching implications for the whole human race; a project which will bring her love, adventure and much, much more. But the brilliant, secretive, unpredictable genius who will bring about her salvation has his own agenda. Determined to put an end to fossil fuel powered personal transport, the project which he runs in tandem will bring about even greater changes to the entire planet. Journalist Lox Tuthill and Detective Sergeant McCall are both determined to track down those involved. But as the fabric of society starts to fall apart, will they have any chance at all to bring a halt to the impending nanoid-fuelled disaster facing humanity? Is Death Really Necessary? is part science fiction, part thriller and part love story. Judi Moore’s title doesn’t really give much of a clue as to the narrative content of what is a very readable book. The story line moves along at a brisk pace and involves a cast of solid, believable characters immersed in a complex but well thought out plot. The author deals with difficult technical concepts in a way that a layman can easily follow. I did feel, however, that the truly dramatic, global repercussions of the nanotech projects described in the book seemed rather inconsequential to the characters involved. These were treated with seeming nonchalance, perhaps some indifference. Nevertheless, I must admit I thoroughly enjoyed this book and thought the characterizations, particularly that of D.S. McCall, worked very well. Judi Moore is a talented author and I do not hesitate to recommend this book.